It's time you hit the road in luxury with this 34KD HD FORCE HD motorhome! 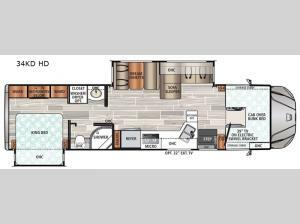 It features a rear private bedroom with a king bed that has nightstands on either side, two wardrobes, and a 32" TV with drawers below, plus you have access into the walk-through bathroom. Inside the bathroom there is even a space for you to add the optional washer/dryer so that you can extend your vacation with clean clothes. You can easily whip up your best meals in the kitchen with the sealed gas range with solid surface covers or even the convection microwave oven, plus the countertop extension provides more prepping space. When you want to enjoy some fresh air without getting sunburnt, head outside and relax underneath the 18' electric awning and if you want more entertainment then you can add the optional 32" LED exterior TV!